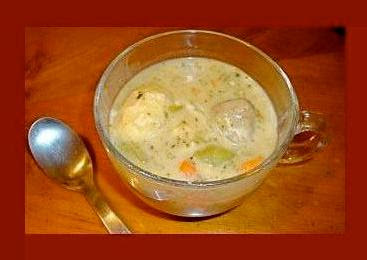 Here's another great stew recipe from my brother, Chris. As Chris would say "It's a great 'stick to your ribs' rainy-day kind of meal." And for the record, I have no idea what makes it "Irish", but I'll go with it. Combine soups, the chopped onion and all frozen vegetables in a pot and cook low and slow. Cook the bacon in a pan and when it's done, throw it in the soup pot. Save the pan with the bacon grease in it. Make meatballs out of the ground turkey, egg and bread crumbs and fry them in the pan with the bacon grease. When the turkey balls are done, throw them in the soup pot as well. To make the drop dumplings, mix the Bisquick with some water and drop spoonfuls (teaspoons) of the dough into the boiling stew. Cook until they're done. I've served this stew over top of a baked potato in a pie plate, and it was incredible. I'm sure it would be great if you poured it over wide egg noodles or some kind of pasta as well.